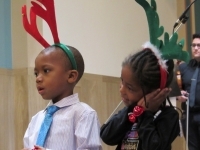 Javon and A'nyla perform "Santa Claus is coming to Town" with St. Jerome Pre-Kindergarten class. Watch out, he knows when you are sleeping! Between scenes violinist Muayad Shahin, cellist Morgan Fox, pianist Lawrence Wallace, and middle-school percussionists performed traditional carols. Scripture readings told the story from the Annunciation to the arrival of the Wise Men. Following the scripture, students read the narration they had written about how it must have felt to “live” the story, from how much courage it must have taken for Mary to tell Joseph that she was with child, not knowing if he would believe her, to Joseph’s great faith to believe the angel and take Mary as his wife and Jesus as his son. The students sang a selection of contemporary Christian and other songs and the 7th grade boys wrote and performed a Rap song about Joseph’s decision. We are very proud of their talents and their hard work.